'We're stronger together now than we were a year ago,' one resident said. One year after the Tubbs Fire burned through the town of Santa Rosa, California, claiming 22 lives, residents are still grappling with what they lost and looking at what went wrong, as they rebuild from the ground up. The Tubbs Fire burned 36,000 acres last fall and was the most destructive wildfire in state history until last week’s Camp Fire set ablaze over three times as much land in a neighboring county. "A lot of that night seems like a complete blur," said Assistant Fire Marshal Paul Lowenthal about the fateful night of October 8, 2017, when the Tubbs Fire overtook the quiet suburb of Santa Rosa. "I just remember hearing sirens... it seemed like for days." For some, the fire came without warning and dealt a vicious hand. In its wake, it left utter devastation with whole neighborhoods reduced to ash. MORE:"First responders detail harrowing evacuations when historic fire consumed Santa Rosa: 'Nature beat us handily'"
Earlier that night, around 11 p.m., Lowenthal, who lives in Santa Rosa, got a call from work – there was a fire over in neighboring Napa County, and he needed to respond to it. On his way there, his car became surrounded by flames. He quickly found himself in the midst of a raging wildfire. Lowenthal realized that the fire was too massive and intense to try and fight, so instead he turned his attention to saving lives; but it was the middle of the night, and most of the city was asleep – so Lowenthal called the Santa Rosa Police Department for help. "It seemed like in a matter of moments, you just heard sirens coming from all directions," he said. "Those police officers just dove in without asking questions and immediately started going door to door and getting people out of harm's way." 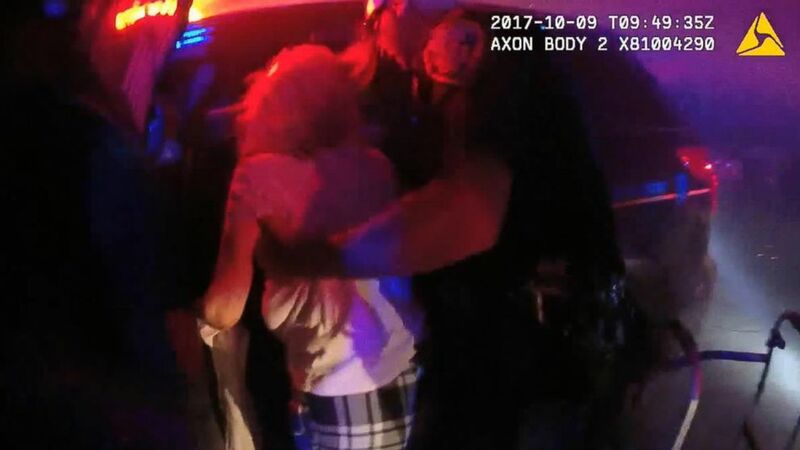 With body cameras rolling, the police officers were deployed to areas where they thought they fire was going, but the winds that night had a mind of their own. "We were seeing embers the size of quarters to the size of footballs flying through the sky," Lowenthal remembered. 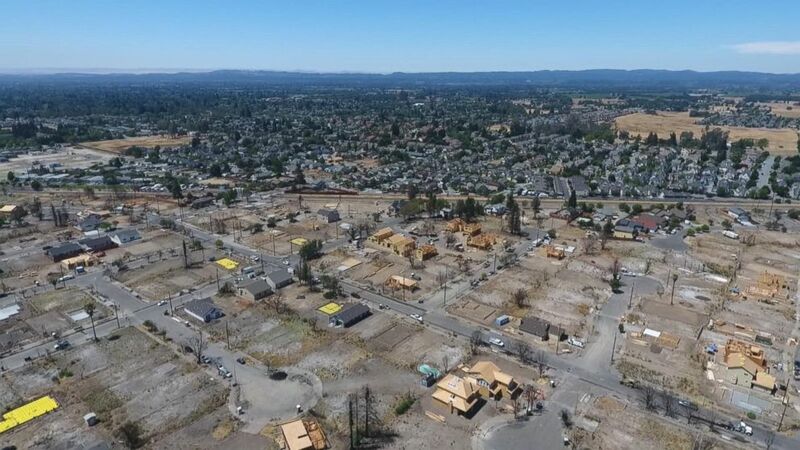 Drone footage shows what the Coffey Park neighborhood of Santa Rosa looks like now after it was destroyed by wildfires nine months ago. The wind pushed the fire farther than first responders had anticipated – leaving some residents in the Santa Rosa neighborhood of Coffey Park unaware of what was headed their way. "It was the loudest wind I’ve ever heard in my life. It was like, just a barreling sound of nonstop wind," Kate Higgins remembered. "I went out to the front yard and seeing it was really windy and smoky and ash was flying," her husband Charlie Higgins said. "Then within that, like less than five seconds, I looked back and there was a wall of red. I figured by the way the wind was blowing, that house was gonna be burned down within 15 minutes." 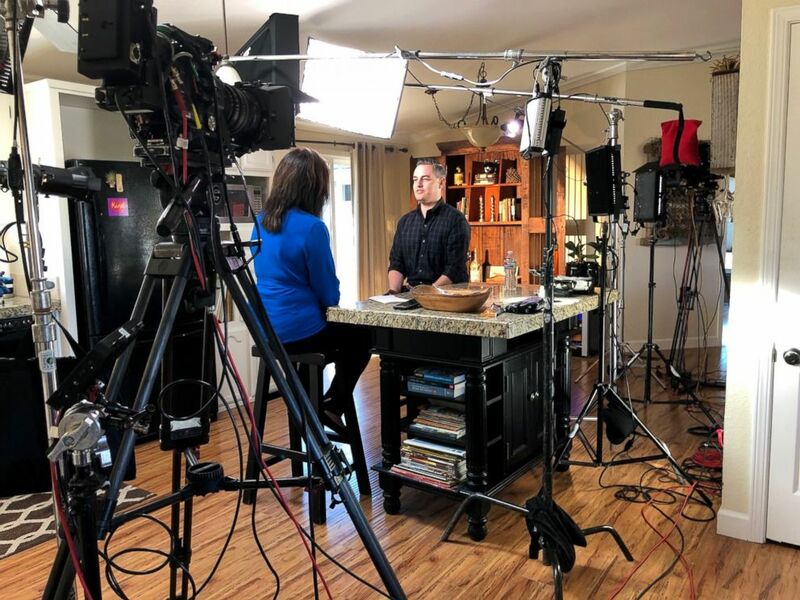 (ABC News) Nightline's Juju Chang Interviews Santa Rosa resident, Jeff Okrepkie, who lost his home in the 2017 Tubbs Fire. Jeff Okrepkie said he and his wife had no time to even process what was happening. "It was like, 'Grab the dogs. Grab some clothes.' I mean we literally pulled a duffel bag out. We grabbed some of our son's stuff, put it all in a duffel bag. It was one duffel bag for the three of us. I get in my car, I turn the corner. And right as I turn the corner, there’s somebody’s lawn on fire. I see flames coming up from over the rooftops. And that’s when it registered with me -- This is bad. This is real bad." In another area of Coffey Park, Ken and Nancy Mazzoni were unaware of how dire the situation was. Nancy said she and her husband believed that the Santa Rosa Fire Department would be able to put the fire out. "The fire department had to be ... they had to be coming. They've got this... we’re gonna help." Police officers approached their house, urging Ken to evacuate, but Ken, holding a hose, asserted that he was "going to fight it out." At the time, Nancy and Ken didn’t realize that whole chunks of their neighborhood were already engulfed in flames. The fire just hadn’t reached their house yet. "He couldn’t grasp it. We were in shock," Nancy said. But terror soon set in when Nancy began to see her block on fire. "There were 30-foot flames in the house across the street from us. All you saw was fire." With only seconds to spare, Nancy and Ken fled their home. The fire spread throughout multiple neighborhoods in Santa Rosa. "It was literally structure after structure after structure burning. Thousands of structures all on fire within a matter of hours. ... It [was] completely wiping out, not only residential neighborhoods, but commercial areas," Lowenthal said. The Press Democrat's photographer, Kent Porter, captured much of the devastation that night. But for all the chaos and fear, the strength of Santa Rosa’s citizens was undiminished. The best parts of humanity were on display that night -- from the city’s police officers to its bus drivers, who volunteered their time to drive their buses through the flames to help evacuate dozens of the elderly. So much of that night was comprised of life changing, split-second decisions to choose courage over fear. At the Kathleen Rose Gardens Assisted Living Facility, Mario Monte was the sole nurse on duty. When a police officer approached the building urging Mario to evacuate, Mario told him that he couldn’t leave - he had five elderly ladies in the house with him that needed help. While the police officer sought backup, Mario began waking the residents up and wheeling them out the front door. 87-year-old Irene Lopez was one of the facility’s residents. When Officer Adams arrived on scene, Mario directed him to Irene. Officer Adams wheeled her out of the house and loaded her into the back of his car while embers rained down upon them. Adams safely drove Irene to an evacuation shelter where she was welcomed by first responders, volunteers and a mass of evacuees - so many afraid of what the morning held. When a new day dawned, Santa Rosa’s residents slowly returned to find the community they once knew, now unfamiliar. Jeff Okrepkie came home to a pile of ruins where his house once stood. "We're driving to our house, and we actually passed our street because everything was burnt," Okrepkie remembered. "It was hard to take in, and it was hard to really grasp for a while." He said many referred to the destruction as a "war zone," a term he feels correctly depicts what he saw. "My neighbors - I had some that owned guns and were hunters, and they had gun safes, and all those rounds cooked off. So, the street was littered with shells and bullets." "I wanted to be sick," Kate Higgins said of returning to the ruins of her home. "Everything we've worked for, all of the things that, you know, we treasured, the gifts from relatives, all of the photos. It's all gone.'" "We had stone columns in front of our house. And those were the only things standing," her husband remembered. On those two stone columns, her husband hung an American flag. It would become a symbol of the community’s strength and perseverance. Okrepkie said in the days and weeks after, he became frustrated when he heard people say, "'They’re just things. It’s just stuff.' In your mind, you... just wanna cuss 'em out. Because it’s … not 'just stuff.' It’s the memorial flag for my wife’s father. My wife lost her dad in Iraq in 2004, and that's all we had left of him. And... it's my son's favorite toy... It's the ornaments that I had from when I was four or five years old. Those aren't just things. Those are... remnants of our lives." 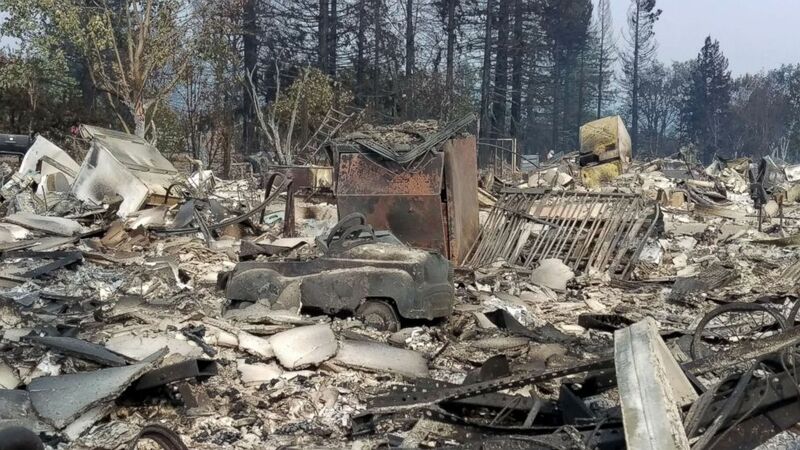 (Jeff Okrepkie) This is what was left of Jeff Okrepkie's home after it was destroyed in the 2017 Tubbs Fire. The fire laid waste to more than 3,000 residences in Santa Rosa. Some of these included the homes of first responders who worked tirelessly to evacuate others... like the house of firefighter Paul Lowenthal. "I was one of seven other firefighters that lost their home that night, and all of us were 100% committed to our jobs... when it kinda finally hit me, it was day five," Lowenthal said. He says he worked for five days straight after his home was destroyed in the fire. Lowenthal said that his fire chief Tony Gossner, and the battalion chief of Cal Fire, Jonathan Cox, finally both told him to take a break. 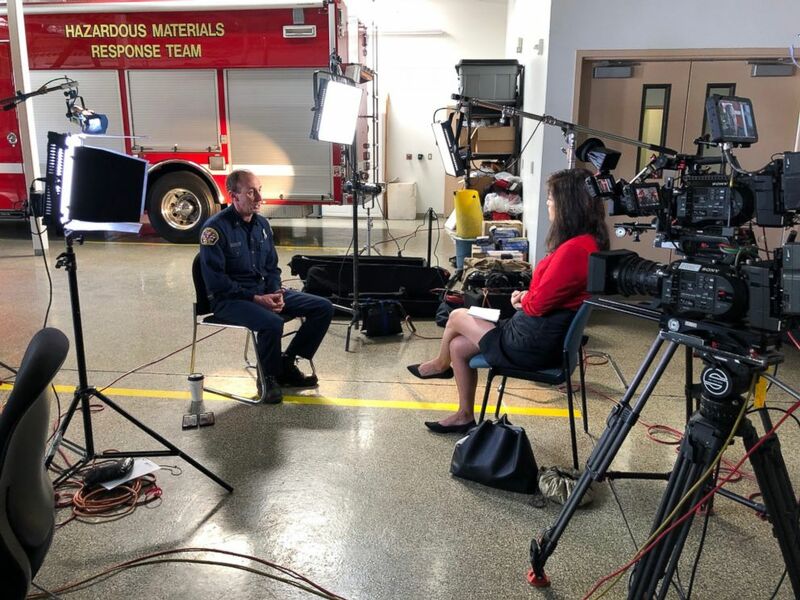 (ABC News) Nightline's Juju Chang interviews Assistant Fire Marshal, Paul Lowenthal, about the 2017 Tubbs Fire. "I looked at him and said, 'I don't really-- where, what do you want me to do? I don't really have anything to go to,'" Lowenthal said. He says the hardest part was having to break the news to his then 9-year-old daughter. "Trying to explain to my daughter that our home... was destroyed in the fire… It was one of the most difficult conversations I have had," he said. Lowenthal is now rebuilding his home. Of the 3,062 residences in Santa Rosa that were destroyed by the fire, 788 are currently under construction. 55 are completed. Nancy and Ken are also rebuilding their home and hope to move back in by the end of this year, as do Kate and Charlie Higgins. 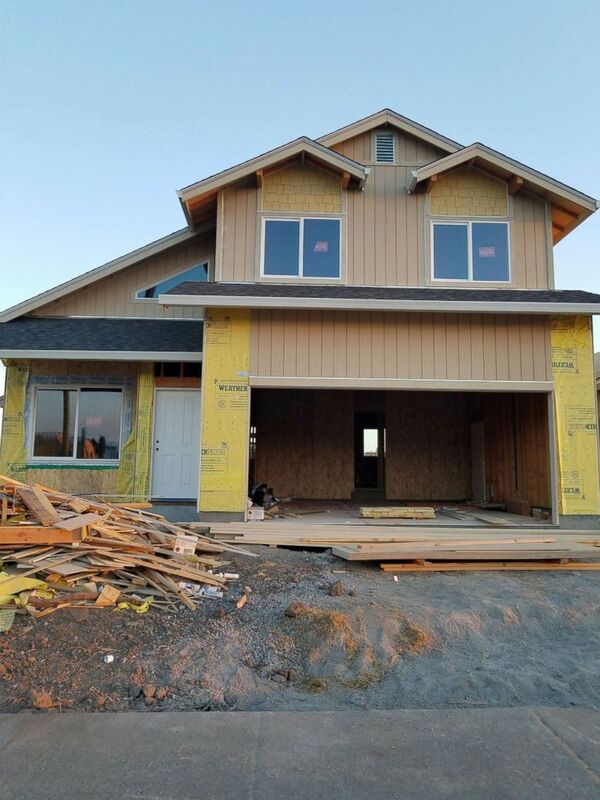 (Nancy Mazzoni) The Mazzoni's are rebuilding their home in Coffey Park, Santa Rosa, and hope to move back in by the end of this year. "Every time we come and there’s a little bit more done, it means we’re a little closer to being back home," Higgins said. "Feels like a little piece of me was being put back together." Compounding Kate’s loss, her mother passed away last Christmas Eve. She says she wants nothing more than to be home in her new house when that difficult anniversary hits. After living in homes in fire prone areas-- so many in Santa Rosa have a constant fear that disaster could strike again. Climate science has found that longer, dryer periods, have created tinderbox conditions, that when sparked, and mixed with coastal winds, are leading to high-speed infernos, like the one we saw earlier this week that destroyed the town of Paradise, California. "Northern California seems to be the spot where we're seeing the destructive wildfires," Paul Lowenthal said. "We're seein' 'em time and time again. So it's definitely becoming the new norm." "The only good thing that’s come out of this disaster is the neighborhood coming together and being more of a family," Jeff Okrepkie’s wife, Stephanie, said. "We’re stronger together now than we were a year ago." 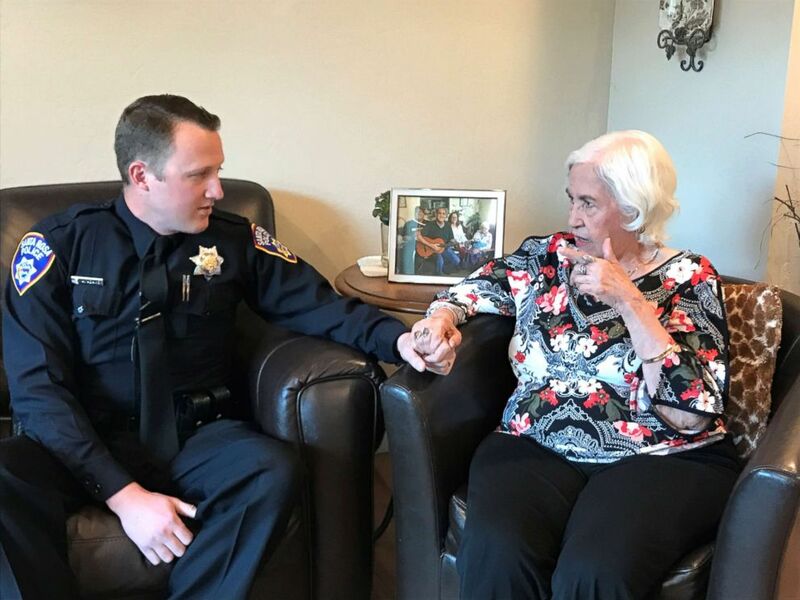 Beautiful bonds were forged in that fire – like the one between 87-year-old Irene Lopez and Santa Rosa police officer Andy Adams. One year after the night of the fire, she finally got to say thank you to Adams for selflessly rescuing her from her senior care home. (ABC News) Irene Lopez meets with Santa Rosa Police Officer Andy Adams who rescued her the night of the 2017 Tubbs Fire. "I’m alive thanks to you," Lopez said. "I’m not gonna forget... I thank God every night and I pray for your family too." Jeff Okrepkie now runs a neighborhood organization called "Coffey Strong." On the one year anniversary of the fire, the group organized a vigil, where more than a hundred people gathered together in Coffey Park to commemorate the lives of those lost and to honor the strength of their community. Santa Rosa police officers and other first responders describe the fear, chaos, bravery and sacrifices they made to save their neighbors in the middle of the night during the Oct. 2017 Tubbs fire. Santa Rosa resident, Ronnie Duvall, hung lights from trees. This Christmas, he plans to have "Christmas in Coffey Park," complete with lights and Christmas trees. He even wants to bring in fake snow for the neighborhood kids. "You can burn a neighborhood to the ground but you can’t take our community spirit," he said. "So what you’re finding here is the strength, the hope, the love - the life - that’s back. And is stronger than it ever was."